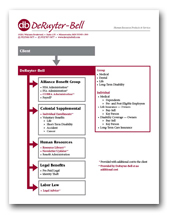 DeRuyter-Bell carefully listens to your needs and tailors our offerings accordingly. Along with the products and services listed below, we can provide strategic advice and insights that help employers craft benefits programs that save money, enhance choices and improve employee participation rates. We would be happy to consult with you regarding your benefit needs and strategic benefits planning.